How does the CS:GO ranking system work? Ever since I started playing with CS:GO, I've been in the bronze rank in Classic Competitive. No matter how many rounds I win, how many times I am the MVP, I won't get a new rank. How does the ranking system work? How do you progress? Since elo systems work on a same basis, I have this post from another game that could explain how elo works, it explains why sometimes you gain more elo and sometimes you gain less. I do not believe there is a way to find out your actual elo, as most games hide them away. First, let's begin with an explanation of the Elo system. I think it would be good to cover what your Elo rating tells you, and what it doesn't tell you. An Elo rating IS NOT a measure of your skill level. Every single complaint or suggestion about how it is unfair because you might be more skilled but still lose points means you do not even understand what the system is trying to measure. The Elo system, and therefore your Elo rating, is a measure of "odds". The Elo system was designed to give a metric that can be used to determine a player's chances of winning. For example, two players with exactly the same Elo rating have a 50/50 chance of winning the match. This spread was originally designed logistically, such that a difference of 200 points, regardless of values, would give the higher player a 75% chance of winning (ignoring the possibility of a tie). It is important to note that there is no point on the scale where you are guaranteed to win. This is especially true of people who are in the middle section (a.k.a. roughly average). Your chances to win do not fluctuate very much, and therefore it is expected that you will lose about as many games as you win. To calculate my chances of winning, based on known information, let's look at an example. Since I like to play AD Carry, I will calculate my chances of winning against my favorite AD Carry player aphromoo. The formula to determine expected score is given as 1/[1+10^((Rb - Ra)/400)] Where Ra is my rating and Rb is their rating. Based on the above Elo ratings, I would have a 0.28% chance of winning. Alternatively, aphromoo would have a 99.72% chance of winning. I can already tell that I'm setting myself up for massive whines by using an example of 1 player against 1 player to explain Elo, so I suppose now is the time to explain why the Elo rating works for League of Legends, even though it is a 5v5 game. It is impossible to measure your individual skill exactly. Your skill can only be inferred based on your ability to beat other players. The matchmaking system in League of Legends takes 10 players of similar Elo ratings and splits them into two groups with team averages as similar as possible. This is, indeed, a fair way of splitting people up into teams. Two teams with similar average Elo ratings will have approximately a 50% chance of winning. If I were to average the Elo of the 5 people I play with most often, we would have an average Elo of 1176. If I were to take the average Elo of the 5 members of team FeaR, they have an average Elo of 2159. Therefore, the expected chance of team FeaR winning would be 99.65%. As everyone expects, we would probably get completely crushed in every lane and it turns out that averaging the five Elo ratings of the players gives a good estimate of who would win a 5v5 matchup. Now, it's time to address some complaints about the Elo system. Why does the thread title say "almost perfect" if everything works fine? Well, there is a slight problem with the Elo system as it is implemented in League of Legends. The problem, though, is not the one that you all think it is, nor is it a problem that has that big of an overall effect on your individual rating. Really, I shouldn't even call it a problem, but more like a potential slight improvement which is likely hard to code and probably exploitable by some of the more "clever" summoners. The League of Legends Elo system uses k-values (a.k.a. how the system determines how many points you gain or lose) that are mostly fixed values based on how many games you play. The only real way to improve on this would be to have a larger k-value for games which are completely one-sided stomps. To illustrate, a game where every lane gets beat, one team gets all the dragons and barons, and completely crushes the enemy team, even taking the nexus before the 20 minute surrender mark, the winning team is clearly significantly better than the losing team and should move up more than in a close game which drags on for 60-70 minutes. There are a number of things that the variable k-value could be based on, however I believe that a scale based on the difference in global gold and game length would be the most fair. What about leavers and trolls? Every player at every Elo has to put up with leavers and trolls. I genuinely believe that leavers should get an increased Elo loss while the rest of the team should get a slightly reduced Elo loss, but again it would have little overall effect on your personal score, but would rather move chronic leavers to a lower Elo at a faster rate. Also, over time, the enemy team will have as many leavers and trolls as your team, so it really balances itself out. I don't believe my Elo rating is accurate. (I think I'm better than it says I am). Play more games. Even with the above mentioned "flaw" with the k-value system, over time you WILL get to your true Elo. More than likely though, you will have to accept the fact that you are not as good as you think you are. Most people are, in fact, average. Finally, I will address what is perhaps the only legitimate complaint about the League of Legends Elo system. Many people around the starting Elo (1200) have not reached their true Elo yet because they have not played very many games. This problem would not be solved by measuring individual skill, nor can it be completely solved with k-values based on the rate that new players join the game. It is a problem that cannot ever be completely solved, but could be slightly alleviated by increasing the number of placement matches by at least double. It could be further alleviated by adjusting the placement matches to measure more statistics than a simple win/loss measure. Also, and this would absolutely help the situation, people doing their placement matches should not be allowed to duo queue, and should be completely segregated from the rest of the ranked population. I personally remember teaming with and against players who had ~100+ wins while I was doing my placement matches, and remember dominating at least three players who were currently doing their placement matches. I can only speculate, but I believe the match ups were directly related to duo-queueing. These changes would, again, have a minor effect on your true Elo rating after several hundred games, but would make it slightly more enjoyable to play ranked matches if your true Elo was actually around the 1200 mark. "More experience than the hundreds of games it takes to even get to level 30 to play ranked? I'd contend that if anything, players should be required to play a minimum number of Draft Normals before queuing up for ranked. A change like what you're suggesting does nothing for the integrity of the system and can actually work to worsen it's effectiveness." To summarize, the Elo rating system works very very well for League of Legends with a few minor flaws. The Elo rating does indeed give a fairly accurate measure of your chances to win against other rated opponents, and this accuracy extends very well to 5v5 matches. There are ways to make slight improvements to the actual matchmaking (i.e. the process of selecting and placing 5 players on each team) but these changes would have very small effects on individual Elo ratings. Certain system changes would make ranked slightly more enjoyable, but overall people are upset over the system because they believe they are better than they actually are. I hope I was able to help you all understand the Elo system a little bit better, and hopefully you all will direct those who need some clarification to this thread so that they may learn a little bit about math. As an active cs go boosting player, I can tell you that wins are not everything. To rank up faster, your personal performance counts, your stats and MVP matter. It's a lot faster to rank up a booster who makes 30+ frags and carry a game, than to a guy who is on the bottom. Even making a TIE you can rank up. In my opinion, just playing well and winning more than losing should make you rank up in time. About skill groups, its not true that playing in low lobby you get less points, we made accounts with globals and silvers in 5 man lobby and still making Silver 3 to Silver 4 even when your opponents are supremes, etc. you need few wins; the system will get your lobby opponents on the same level, so don't worry if your friends are lower, if thay play well just play with them. After the new patch, there are some problems to get your real rank to your hidden ELO but ranking up is still similar, only making supreme to global is now a lot harder 25-50 wins. 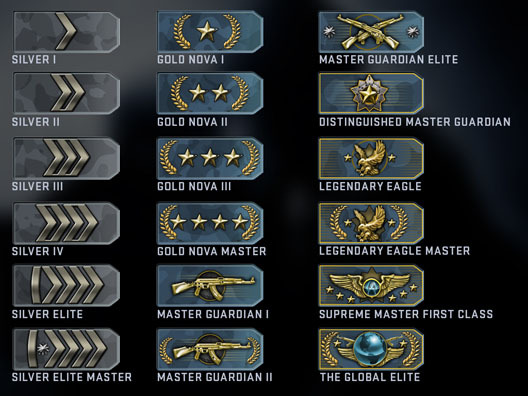 Does CS:GO have a default rank when you've reached 10 competitive wins? How do I get case drops in CS:GO? What opponents do I have to expect as a ranked player with an unranked player in tow?